The Anti Car Lifting Cell SSP Mr Asad Raza held a meeting with all local bike assemblers including Japanese and Chinese on July 23, 2018 at ACLC Head Quarter Karachi. The meeting was called to find ways and means to improve motorcycles security features. For the last two months the bike snatching and theft have increased manifolds. According to ACLC, around 50 bikes are lifted or snatched daily in Karachi while market sources said that these those bikes whose FIRs have been registered in the Police stations while actual figure is more than 50 units per day. The security system of costly bikes such Honda CB150F, all models of YBR 125cc Yamaha and Suzuki GR150cc and GD110S is effective because switch and handle lock are integrated with each other in the handle. This is much safer than manual handle lock. In the main stand of these costly models the companies have put a hook and hole so that bike owners can hook the bike with chain. 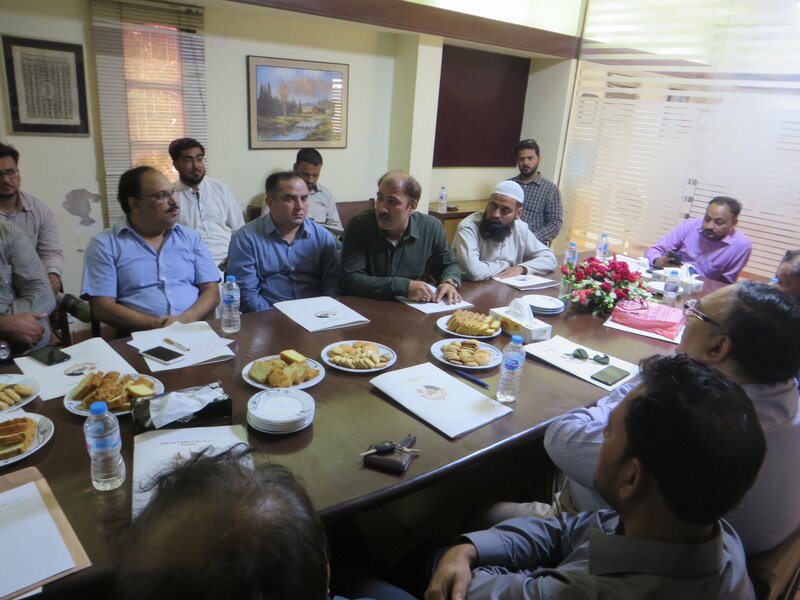 Chairman Association of Pakistan Motorcycle Assemblers (APMA), Mohammad Sabir Sheikh informed the meeting that there is no need for any security system or tracker as it is not feasible in 70cc bikes which hold 80 per cent market share especially in Karachi. A Japanese bike representative said it is impossible for the company to change the design without permission of Japan based Head Quarter. Design changing will need at least four to five years because Japanese companies make products for many countries and they cannot take decision for one country, he added. Some participants of the meeting, however, agreed to take up the matter with design engineers. Bike assemblers (Chinese and Japanese) did not agree on this point. Manufacturers said change in design is a big task on which the SSP ACLC also endorsed this point. Sabir said there is a dire need to check the record of Excise and Taxation as the department had installed computerized system a decade back and prior to that the department was dependent on manual records. In Karachi, huge number of bikes is more than 20 years old. There is also no law for age restriction of two wheelers. SSP ACLC was of the view that assemblers must fix some extra lock or hooks for fixing extra locks or some electrical devices at manufacturing stage, but majority of assemblers did not agree with the SSP ACLC because the main Japanese producers need to change the design of bikes which looks impractical. 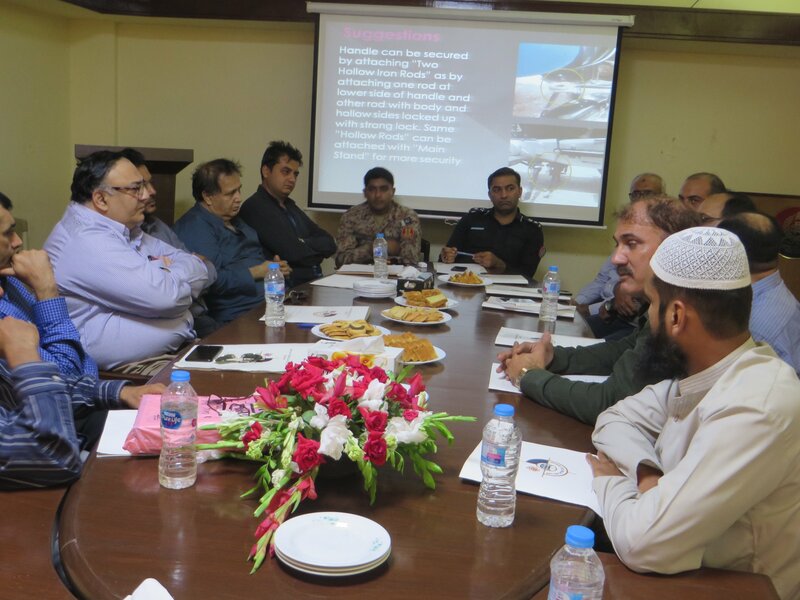 It was decided that a new meeting would be held in future in which more assemblers, who could not attend, would be called upon besides ensuring participation of Excise and Taxation Department, Ministry of Transport Sindh and Home Department so that its legal complication could also be discussed. Sabir said electric bikes can help resolve the all issues of bike security. Karachi police’s Anti-Car Lifting Cell (ACLC) in March busted a gang of motorbike snatchers involving employees of Pakistan Air Force (PAF) and Pakistan Navy. The official said 14 motorcycles were recovered from the possession of the arrested suspects — identified as Sohail Murtaza and Younas Jones. “Their accomplice Shahjehan, an official of Pakistan Navy, is still at large, ACLC said. Sohail Murtaza is a civilian employee of PAF while Shahjehan is part of the administrative staff at a Navy complex. The arrested suspects would evade security checks after committing crimes by showing their service cards to the police, SSP Raza maintained. They took stolen motorcycles to chop shops for selling parts in other areas, he added. The ACLC in July claimed to have arrested two bike-lifters in Karachi who are said to be a part of gang comprising many of their family members, all involved in stealing motorcycles. The ACLC personnel arrested two suspects Sabir Khokhar alias Kala and Mohammed Ashraf Khokhar, said Asad Raza, adding that their gang has stolen around 2,000 vehicles from the metropolis over the last few years. This gang of bikes-lifters is known as Khokhar group. The arrested suspects belonged to Punjab and had settled in different parts of the metropolis. Initially, their elders were allegedly involved in this criminal activity and later on their children also became involved in it. Abdul Ghafoor Khokhar and his cousins, all hailing from Jhelum District of Punjab, formed a criminal gang in Karachi 1990s and started committing vehicular theft, SSP Raza said. Around 25 to 30 members of Khokhar group are involved in bike-lifting. During the last 10 years, this gang has stolen 1,500-2,000 motorbikes, which were subsequently sold in Balochistan via their links with criminal elements in Khuzdar. These efforts are not enough at a time of rising number of bikes in the city per day. In a big city like Karachi with population of over 20 million — ACLC needs to engage more manpower to thwart the plans of organized and un-organized bike lifters and snatchers. ACLC has been running print media campaign asking bike owners to install additional locks like tyre locks and hook below the handle for putting the lock. Always park your bike in allotted parking areas and get authorized parking slip, the campaign says. In case parking is not available try to find parking where CCTV is installed. Avoid parking in deserted and low lights areas. It has been proved that those bikes are safer which have tracker and anti theft switch installed. It has been observed that many people do not like to park their bikes in parking area to avoid Rs 20 per bike being charged by the local administration. For many Rs 20 holds a lot of importance when earnings are low. They said an illegal practice is going on as most of the parking fee collectors do not give KMC parking slip. People said that it is not clear as to where KMC utilizes this parking fee and how much amount is collected on daily basis in Karachi. Bike owners said sometimes they pay multiple parking fees like one parking fee before purchasing any ready made garments and again pay the fresh fee after a gap of few hours or the next day in case of any alteration in the ready made garments. They said there should be some time relaxation period between the first parking fee and the second parking at same place to avoid multiple parking fees. Due to rising number of bikes and limited parking spaces – the KMC has started charging parking in almost every markets and shopping malls where the volume of bikes is soaring. Now the KMC officials are also seen charging parking fees at hospitals which is an additional burden on consumers’ pocket. Again multiple fees are charged if the persons frequently visit their patients. Sabir said time has come to encourage electric vehicles in the country. The PML-N government has already reduced customs duties on import of CBU electric cars to 25 per cent from 50 per cent while the rate of duty for CKDs is 10 per cent. The SRO 644(I)/2018 dated May 24, 2018 under PCT Code 8703-8090 relating to duties on electric cars is confusing as the last government has mentioned the word “vehicles” which means all vehicles including two wheelers. “This confusion now needs to be rectified by the new government or the interim government as number of investors is working on electric vehicle projects,” APMA chief said. A new trend is coming into Pakistan where young girls and ladies are purchasing bikes to meet daily routine work, he said. “Electric bikes are ideally suited for the ladies and young girls as all over the world the sale of these bikes are rising,” he said. In Pakistan conventional or petrol engine two wheelers are now considered as flop as Atlas Honda Limited has been working on only two models (CD70cc and CG-125cc) for decades and all Chinese assemblers have been producing replica models of these two bikes. Yamaha and Suzuki have tried to bring change by introducing new models and engine technology but higher prices do not lure more buyers. If the government immediately removes confusion over electric bike SRO relating to the word “vehicles” the bike market will see a big change within a year in terms of models and designs of electric bikes. Commercial vehicles and small cars will throng the markets. Pakistan’s small car market has also failed in providing any variety to the consumers as locally assembled Suzuki Mehran 800cc rules the market with no competitor. He said this trend also needs to be changed by replacing Mehran with small electric vehicles. The imported used 660cc vehicles have changed the dynamics of car markets owing to its rising demand. Two and four strokes rickshaws are already posing serious threat to the environment of big cities. Electric three wheelers will change the scenario by providing pollution free environment in big cities especially Karachi and Lahore. With the introduction of small electric vehicles – the heavy vehicle industry may also shift towards electric commercial vehicles. Published in Automark Magazine’s August-2018 printed edition.